March 27, 2019 – Cat food puzzles are exactly what they sound like. The puzzles can be any object that holds food and requires your feline friend to figure out how to get it. The puzzles come in all sorts of shapes and sizes. Food could be cleverly hidden inside a ball or other mobile device and only by rolling it or pushing it will the cat capture the tasty treat. 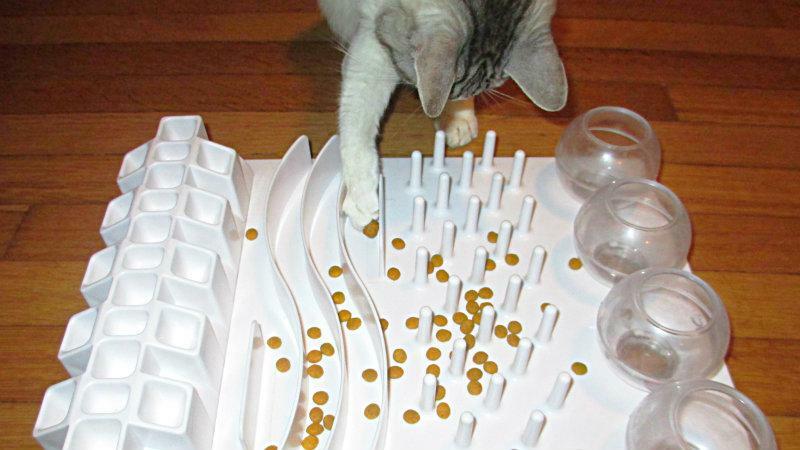 Other puzzles are stationary with cups or holes that require cats to fish out their wet or dry food with a paw. Thirty percent of cat owners surveyed use food puzzles, according to a new study led by researchers at the University of California, Davis. The puzzles benefit domestic cats by bringing out their natural foraging behavior. Delgado suggests owners throw away the food dish and make their cats return to work. Enrichment activities like food puzzles may improve their cat’s welfare by increasing mental stimulation, as has been demonstrated in several other species such as laboratory rats, zoo animals and pet parrots. Although no experiments have yet looked at whether food puzzles help cats with weight loss, Delgado co-authored a 2016 paper that presented case studies where food puzzles aided cats with weight loss, anxiety and urination outside the litter box. The online survey, conducted from January to April of 2018, was designed to assess how cat owners fed their cats and their attitudes about cat food puzzles. It found only 30 percent of participants currently use a food puzzle, 18 percent had tried them but stopped using them, and 52 percent had never used a food puzzle. 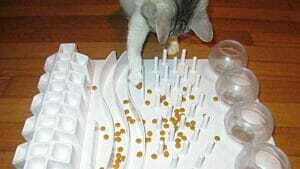 People who had tried using cat food puzzles but stopped most commonly blamed the cat. Owners said their cat was too lazy or never figured them out. Most healthy cats should be able to figure out and use a puzzle for a significant portion of their diets without too much assistance, Delgado added. The most common reason for not ever having used a food puzzle was having a dog or multiple cats with different diets or weight goals, although 8 percent had never heard of food puzzles. Researchers said more work needs to be done to help cat owners provide an enriched environment for their cats. They recommend that cat owners work with their veterinarians to come up with a plan for feeding their cats. In total, 3,192 people completed surveys. The study was published Tuesday (March 26) in the Journal of Feline Medicine and Surgery. The research was supported by funding from Maddie’s Fund.